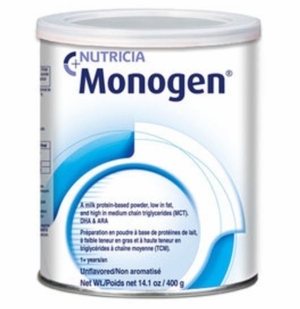 Monogen is a nutritionally complete, low fat, whole whey protein powdered feed, low in long chain triglycerides (LCT) and high in medium chain triglycerides (MCT), containing linoleic acid (LA) and alpha-linolenic acid (ALA), and supplemented with docosahexaenoic acid (DHA) and arachidonic acid (AA). Monogen is available in neutral flavour only. Nutricia Monogen is suitable for use as a sole source of nutrition in infants or a supplementary feed for children over the age of one and adults. Use under medical supervision. Not for parenteral use. Not suitable for use as a sole source of nutrition, unless indicated in the product description. Flavouring is not recommended for infants less than six months. :: Ingredients: Maltodextrin, skimmed cow�s milk, refined vegetable oil (medium chain triglycerides (coconut and/or palm oil), walnut oil, high docosahexaenoic acid single cell oil, high arachidonic acid single cell oil), whey protein (from cow�s milk), caseinate (from cow�s milk), glucose syrup, sodium citrate, potassium chloride, calcium carbonate, magnesium hydrogen phosphate, choline chloride, L-valine, inositol, L-tryptophan, L-ascorbic acid, sodium L-ascorbate, taurin, L-iseleucine, ferrous sulphate, zinc sulphate, L-carnitine, DL-?-tocopherol, calcium D-pantothenate, copper sulphate, manganese sulphate, pyridoxine hydrochloride, thiamin hydrochloride, retinyl acetate, riboflavin, pteroylmonoglutamic acid, potassium iodide, chromium chloride, sodium molybdate, phytomenadione, D-biotin, sodium selenite, cholecalciferol.